Central: Will the Wings win again? Believe it or not, Detroit Red Wings General Manager Ken Holland said he's "scared spitless" about his team winning a game right now. Before we delve any further, let's just remember that we're talking about the defending Stanley Cup champion Detroit Red Wings, a team that basically returned intact from last season, save for adding superstar forward Marian Hossa to the mix. And don't forget that the Red Wings are 4-1-1 through 6 games, though they start a five-game road trip Saturday in Chicago, followed by stops in Los Angeles, Anaheim, San Jose and Vancouver. "I look at our team and I don't know if we're going to win a game," Holland told NHL.com. "I'm scared at this time of the year. Every team feels good when you have 20 to 25 games put away. You've got some points banked in. You've got a cushion that if you lose a game, it's OK. When you're early in the year, there is always a fine line." OK, so it's not that Holland is worried that his team isn't as good as everyone believes it already is. He's instead concerned because it's early and he isn't quite sure what all the other teams have to offer. Atlantic: Zherdev's found a home in N.Y.
That's why right now, even though the Red Wings appear to be the overwhelming favorite on paper, Holland shoots down any notion that Detroit will run away with the Central Division title the way it did last season. There is too much uncertainty for him to make that kind of sales pitch, even though most other pundits around the game are doing it for him. "I know our team, but I don't know other teams," Holland said. "Some other teams have made lots of changes and some teams have got young players, and the difference of being 22 or 23 or having a year in the League versus having none can make a big difference. I always look at the standings at Thanksgiving because I think, 'Let's play everybody once. Let's get a feel for the League.' I know our team now, but I don't know the League." Holland said right now he's concerned about the Wings' uncharacteristic flaws with the puck, saying they are turning it over more than they have in recent years. He did express his pleasure with the power play and especially with Tomas Holmstrom, who had 6 goals through 6 games, including 4 on the power play. He also said Hossa, who has 1 goal and 5 assists through 6 games, appears to be getting more comfortable with each game. Pavel Datsyuk has 7 assists and Brian Rafalski has 1 goal and 6 assists through 6 games. "I don't think we have played great, but I think the other teams are better," Holland said. "There is no one game on the schedule that you can call a win. Every night is a grind." That's what the other teams think when they play the Red Wings. Who knew that's what the Red Wings thought, too? "We've got a veteran group of people that understand the game is played on the ice," Holland said. "It doesn't matter if you're picked to finish last or picked to finish first. You have to do it on the ice." Rookie report -- St. Louis defenseman Alex Pietrangelo is back in the lineup after missing 3 games due to being driven into the boards from behind Oct. 13 on a hit by Toronto forward Ryan Hollweg. The Blues put Pietrangelo on the injured-reserve list Wednesday to make room for forward David Koci, a waiver-wire acquisition from Tampa Bay. The Blues backdated Pietrangelo's stint to the Leafs' game, meaning he sat out the required 3 games for being on I.R. and was available to come off at any time. Troy Brouwer and Jack Skille may have passed each other on the road from Chicago to Rockford, Ill., earlier this week. Brouwer, who had 2 goals and 6 assists in 5 games with the Blackhawks' American Hockey League team, the IceHogs, was called up for Skille, who had a goal and 5 penalty minutes in 6 NHL games. Brouwer skated with Martin Havlat and Patrick Sharp against Edmonton on Wednesday night; he played 13:33 and was a plus-1 with 2 penalty minutes and 3 hits in the 3-0 victory. Kris Versteeg continues to shine for the Blackhawks. He has a goal and 6 assists through 7 games and now finds himself playing left wing on a line with Jonathan Toews and Patrick Kane. Patric Hornqvist was a healthy scratch Thursday night against Calgary as Jason Arnott and Nick Tarnasky returned. It was Tarnasky's first game as a Predator. Hornqvist has a goal and 14 shots in 6 games while averaging 13:45 of ice time per game. 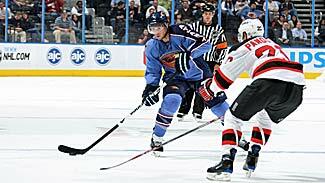 The Blues, who have a glut of forwards, sent Chris Porter down to Peoria of the AHL on Thursday. Hard-working Hawks -- On the surface, the changes coach Joel Quenneville has implemented in his first 8 days on the job seem minor. The Blackhawks, though, are feeling one major difference, and they have benefited from it. "We're going up-tempo in practices," Blackhawks defenseman Brent Seabrook said. "They are short practices, but quick and hard. We're playing like it's a game, and if you're doing that it's easier to transfer it over to a game. It's a little harder in practice, obviously, but when the games come along it's definitely a lot easier when you're playing at the same speed as you are in practice. Things don't seem as fast." Seems like a simple concept, but it works. The Hawks outworked the Edmonton Oilers Wednesday and came away with a 3-0 victory. Goalie Nikolai Khabibulin, who stopped all 23 Oilers shots, said his team outskated the Oilers, which led to strong defensive-zone coverage and resulted in a lot of perimeter shots for Edmonton. "When everybody works hard it's easier to communicate," Khabibulin said. "The guys are really talking in the locker room about that and try to concentrate on it. In practice we try to do that and obviously it helps in a game." This and that -- According to the Columbus Dispatch, Blue Jackets forward Fredrik Modin will miss at least the next 2 games with a groin injury. Modin missed Tuesday's game against Vancouver, a 4-2 victory. Columbus did get Michael Peca back into the lineup Friday following the end of his 5-game suspension for contact with an official. Defenseman Aaron Johnson's goal for Chicago on Wednesday night was his first of the season, first as a Blackhawk, and first of any kind since March 29, 2007, when he was with Columbus. Johnson, who also has 2 assists this season since being recalled from Rockford on Oct. 13, had 2 assists in 30 games with the New York Islanders last season. According to the St. Louis Post-Dispatch, Blues defenseman Jeff Woywitka cleared waivers and was sent down to Peoria of the AHL. Judging from coach Andy Murray's reaction, the Blues must have been scared Woywitka was going to be claimed. Woywitka has missed time this season with a broken foot. "Jeff Woywitka cleared waivers and we have a sigh of relief on that because he is a guy that we expect to play games for us this year, and to lose him on the waiver wire would have been tough," Murray told the newspaper. "He'll get an opportunity to play in Peoria now and be in a better position to come up and help us."